Ensemble historique de Santa Coloma is part of the Tentative list of Andorra in order to qualify for inclusion in the World Heritage List. In Sept 2018 things had moved on at Sta Coloma since Hubert’s visit/review in 2014. Our hotel (The Garden – "Ok" at 60 Eur B+B for 2 with ample free parking) was situated in the Andorra la Vella suburb of Sta Coloma immediately opposite the alley leading to the church, so it was no problem at least to have a look at it from the outside. We had tried 2 of the Romanesque Churches from Andorra’s other T List entry – St Joan de Casselles and Sant Miquel d'Engolasters and found both closed so I haven’t bothered to do a review of them. However we were “in luck” with Sta Coloma and found it open – AND with a new “videograph” presentation. 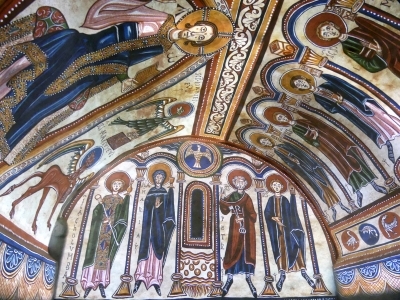 The Church contains just one in situ mural – a partial “Agnus Dei” in a medallion surrounded by 2 angels dating from the 12C and created, it is believed, by the “Master” of St Coloma. This is located at the front of the nave just before the apse. In the apse itself there should have been a complete set of pre-Romanesque paintings by the same hand, but these had been sold in the 1930s - apparently to help pay for repairs to the church. They were confiscated by the Nazis from the original Belgian collector and finished up in Berlin. However, in 2007 they were recovered (at a cost of over 4 million Euros!) by the Andorran government. The decision has been made not to try to return them to their original location but rather to build a museum next to the church. We didn’t notice the building under construction but then we weren’t looking for it - its planned 2018 completion date seems at risk, however. What has been produced to date is a 6 minute video which projects the paintings onto the whitewashed ceiling and walls of the apse in 2 forms – their (current?) faded form and a reproduction with the colours which they would once have had (Photo). The partially remaining mural on the front wall of the nave is also “completed” and enhanced. It appears that we were lucky as the current viewing arrangements only lasted until end Sept 2018 – but since the projection cost 130k Euro and required installation of special equipment in the form of 6 projectors, it will presumably be repeated. I guess that the problem is that it seems to require an “operator” to be present. This article describes more about it and indicates the sort of plans foreseen for showing the projection in future as part of the overall museum/church display. The projection was interesting and certainly “added value”. Despite this extra feature and even the upcoming museum showing the original, I wouldn’t have thought that the chances of this church ever gaining inscription, however important it may be to Andorra, would have been increased - but if you are in the area it is worth checking out. I also think back to the issue raised by the Chauvet Cave and the arguments about showing/not showing replicas - could this be another example of what the “future” for viewing some artworks might look like? It might as "easily" be done for artworks which are just receiving too many visitors - a replica building and the highest quality projection of the original. It is not clear to me why Santa Coloma is a separate T-list entry and why it is not included in the "Eglises romanes d'Andorre" site. Maybe because the round bell tower is unusual, or because original murals from the 12th century can be seen inside. However, we could not assess their quality, the church was closed. But Santa Coloma seems to have a special significance in Andorra, because since 2014, the church is depicted on the 10, 20, and 50-cent coins. The "Ensemble historique" also includes the church of Sant Vicens d'Enclar, which is located on a hill just above the village. But it can only be reached by foot and we did not visit. 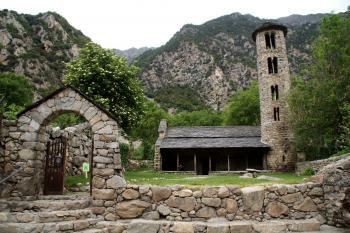 Santa Coloma is located only a few kilometers from Andorra la Vella, and a quick stopover might be worthwhile to check whether the church is open and the murals can be visited.